George Coppinger Ashlin (1837 – 1921) was an Irish architect, particularly noted for his work on churches and cathedrals. Ashlin was born on 28 May 1837, in a house named “Carrigrenane” in Little Island, Co Cork. He received his early education at the Collège de St Servais, Liège. While at St Mary's College, Oscott (1851–5), with which Augustus Welby Northmore Pugin was strongly associated, he studied drawing and perspective and developed an interest in architecture. Between 1856 and 1860 he was articled to E.W. Pugin(whose sister Mary he married in 1860) and in 1858 he entered the Royal Academy Schools, London. When in 1859 E.W. Pugin received the commission for SS Peter and Paul, Cork, he made Ashlin a partner with responsibility for their Irish work, a position he retained until about 1870. Their practice was primarily ecclesiastical, the remodelling (1869) of Enniscorthy Castle for Isaac Newton Wallop (1825–91), 5th Earl of Portsmouth, being one of their few domestic projects. They worked on some 25 religious buildings. The Augustinian church of St. Augustine and St. John, Thomas Street, Dublin (commissioned 1860, opened (1874), in a style inspired by French architecture, is one of their most successful designs. The site drops towards the river, so that while the entrance is at street level the nave and chancel are raised considerably above the surrounding streets, a dramatic effect enhanced by the soaring spire. Their churches in the countryside, mainly in counties Wexford, Cork and County Kerry, are simpler, with straightforward Latin-cross plans, good quality stonework and simple bellcotes. The church at Lady’s Island, Co. Wexford adjoins the parish of Tagoat, the church of which was designed by Augustus Welby Pugin in 1846. 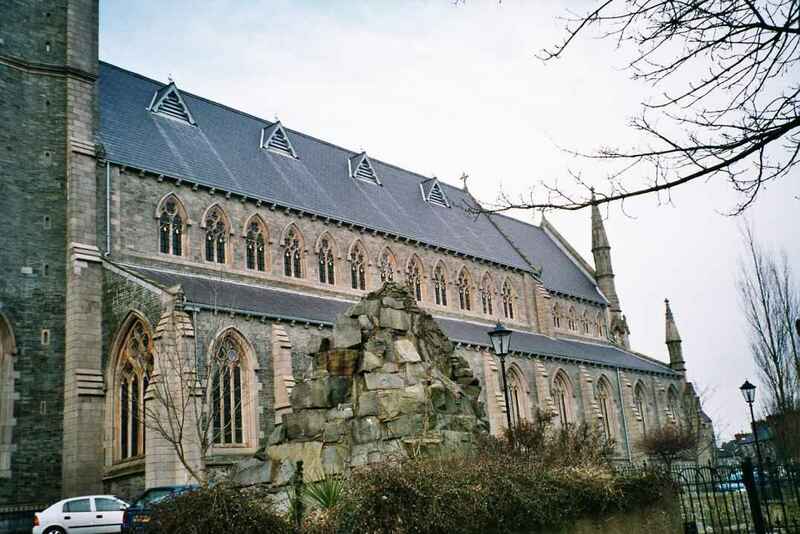 By far the most important commission undertaken in Ireland by Pugin and Ashlin was the building of Cobh Cathedral (1869-1919) which was realization of the ideal gothic church advocated by Adolphe Napoleon Didron in his Annales Archéologique. The partnership broke up in 1870 and Ashlin practised on his own. During this time he designed a number of churches, including St. Mary Magdalen’s Dominican Church in Drogheda. aisles, transepts, two chapels and a baptistery.